I'm running a tiled map with world composition, using 500 tiles at 1km each. I want to change the LOD transitioning from -1 to 3 for more natural looking mountains at a long view distance. I can't find the Landscape parent that controls the LODs, and I have actually never seen it. How do I generate it? 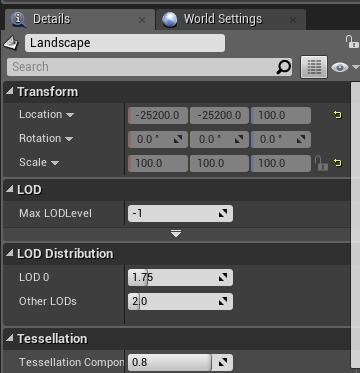 If I make a new landscape, the LOD transitioning just affects that landscape actor, not my tiled landscape. I've looked through all the levels, and cant find it. I also looked in Persistent level, etc. How to Open LOD visualizer? All foliage of a type are switching LOD together. How to fix this?